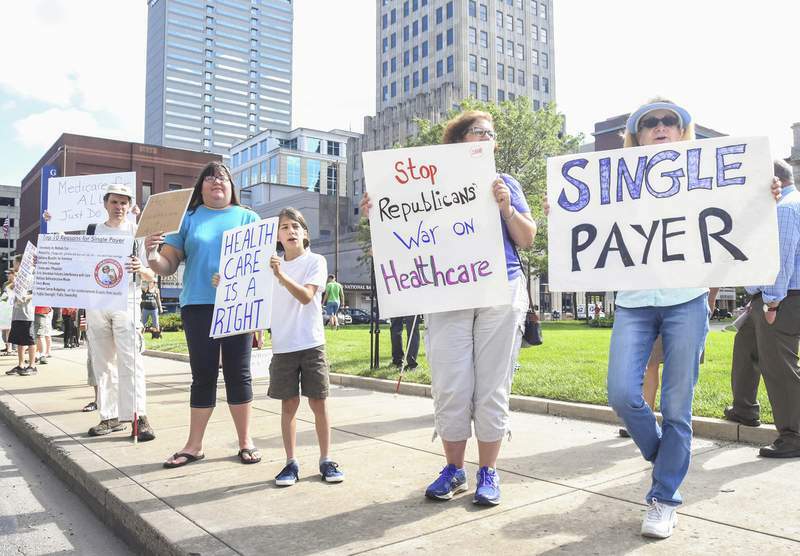 Michelle Davies | The Journal Gazette Participants of the Millions Marching for Medicare for All rally line the sidewalk Monday at the Allen County Courthouse Green. About 60 people sang “Happy Birthday” to Medicare on Monday at the Allen County Courthouse Green. The federal health insurance program for people over 65 was signed into law by President Lyndon Johnson on July 30, 1965. The courthouse crowd wished for President Donald Trump and his Republican Congress to extend Medicare to Americans of all ages. “What do we want?” Edith Kenna asked through a megaphone. “Single payer,” the crowd yelled. “When do we want it?” Kenna asked. They were part of Millions Marching for Medicare for All, a nationwide series of rallies and marches aimed at persuading lawmakers to go far beyond repealing and replacing the Affordable Care Act and adopt a universal, single-payer, tax-supported health care system. The House has approved ACA repeal-and-replace legislation, and the Senate might vote this week on its own proposals to overturn the law, also known as Obamacare because it was a signature accomplishment of President Barack Obama and a Democratic Congress. The ACA requires most people to carry health insurance, provides subsidies to help pay for it and makes insurers cover pre-existing medical conditions. “They have failed because Obamacare itself was health insurance reform, not health care reform, and the markets obviously cannot keep going without massive infusions of money, massive infusions of your tax dollars going to insurance companies who then turn around and deny our care and charge astronomical premiums, co-pays, deductibles,” Kenna said. The number of ACA insurers in northeast Indiana has shrunk from six in 2016 to four this year to two in 2018. Kenna challenged Sen. Todd Young, R-Ind., who has not said how he might vote on health care bills being considered by the Senate, to a debate. Meanwhile, Sen. Joe Donnelly, D-Ind., announced Monday that if and when the Senate votes on health care legislation, he will offer an amendment to protect Medicaid, the federal-state insurance program for low-income people and people with disabilities. The ACA expanded Medicaid programs in many states, including Indiana, where the program is called Healthy Indiana Plan 2.0. The Republican Senate health care proposal would reduce Medicaid spending – including a 14 percent cut for Indiana, according to an estimate discussed recently by the National Governors Association. Also Monday, Gov. Eric Holcomb wrote a letter to Hoosiers in which he called for the federal government to remove mandates on how Indiana spends federal health care money; work with the state to provide flexibility in how health care services are delivered; and provide additional funds to combat the opioid abuse crisis. Holcomb seeks federal permission for Indiana to require that some adults have a job or be enrolled in a work-readiness program in order to qualify for Medicaid.